The Mirror Project had its beginnings in one of those happy accidents my work is prone to. I had been out on the river trail one late afternoon in mid-December last year, when the mists had risen, or the clouds had lowered, so far that the dogs and I were walking through a lovely, softened, bejeweled world. I took some pictures with the cell, hoping to catch some of the feeling of the day. Later that weekend, I started working on a set of notecards from the images. As I was formatting, I thought to flop the image, gray it out, and use it for the back, under the usual back-of-card words. From the first one, and through the next three, I was intrigued with the symmetry and patterning of the whole, with the things that showed up unexpectedly around the conjunction point. And then I did the fifth one, and Mist Man showed up [Mirror 005], and I was completely delighted. 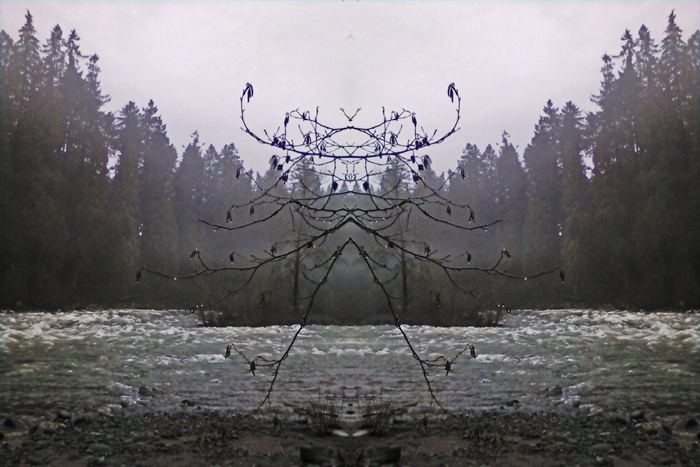 Towards the end of the month, I played with mirroring some of the pictures my two days in the beautifully frozen Gorge had yielded, and used them as thumbnail “dividers” for a set of character glimpses I had written. New Year’s morning, I woke up and realized that I wasn’t just playing – that this project is the place my art [Mirrors] and words [Reflections] come together, and that it is my opportunity to communicate what these walks, these places of wild and quiet, mean, to me and as a reflection of what lays in the behinds and underneaths . Each Phase of this Project is 111 images. There are 11 Phases planned over ten years, making the totality of the Project 1221 images. The base and heart of the Project is source photographs from the daily walks with the dogs to the river and in the woods, around my home environment of Corbett, Oregon. In Phase One, these images comprised over 75% of the total, the balance consisting of a December, 2009 ice event in the Columbia Gorge, and a dozen images from a trip to visit my father in Ocean Shores, Washington. Additional Phases have held to my intent of maintaining this base of at least 50% local images, with one to two “guest appearances” in each series. My focus for the explorations away from my home environ is twofold. The first and most important is to work with small environments which are nothing to the world, but which are dear to one person, just as my two mile hike to the river is dear to me. The second is to encompass the larger, known landscapes, and to discover what is hidden in the betweens of the places we have seen well documented. To date through Phase Five, Yosemite National Park; Avenue Of The Giants; Humboldt Bay; and the Rogue River area have been included in the Series. Ten additional prints at 17″ to 28″ width. Two Artist Proofs, at 11” width. Height varies dependent on format of original. All Edition prints include package with full information on the image, artist, and project. There is no open edition of any print over the size of 8” x 5”.